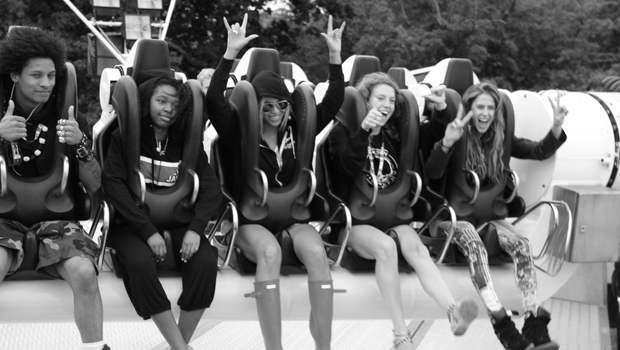 Beyoncé, who headlined Saturday night’s Virgin Media V Festival did not just perform at the Chelmsford festival but managed to sneak in some time on the fairground rides. Cleverly disguised under a black hood and red aviators, the newly bobbed pop superstar went unnoticed as she took her spot on the hair-raising rollercoaster ride, accompanied by fellow daredevils, her loyal backing dancers. Proving the multi-million dollar music mogul – who last week cycled across the Brooklyn bridge to her Barclays Centre Mrs Carter World Tour show – was no different from any other festival reveller, Beyonce pulled poses for the camera. Seriously, how cool is Beyonce? Now we know how she raised the adrenaline for her high power performance on the main stage later that night. Beyonce‘s behind-the-scenes view of the festival can be found on Tumblr where she’s taken to sharing intimate snaps of her family, friends and recent world tour in previous months. She’s especially proud of her new blonde bob on the picture sharing site and has been fishing for compliments since unveiling the new ‘do on Thursday, following a short-lived experiment with a pixie crop. After all the afternoon’s hair-raising antics, her new bob certainly had all the volume it needed when she showed off a curlier style on stage. We reckon we might just stick to the blow-dry if it was us.